We are really happy and proud to be able the release the IPCH Classification Manual edition 2017. 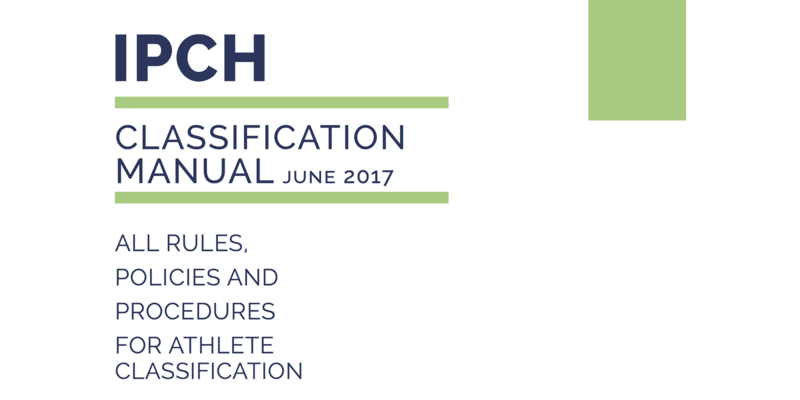 Classification is a fast moving field, in Sport Assembly 2016 the basics and basis of the IPCH Classification Manual and its 1st edition were presented and agreed by the represented Nations. That document was based on the IPC Classification Code valid until end 2016. In January 2017 a new version of the IPC Classification Code was released. During the IPC Head of Classification meeting held in Bonn in February IPC released the new updated Classification Code and announced that all the International Federation recognized by IPC and also IPCH would have to undergo an audit to check the compliancy of the Classifications System and Procedures with the IPC codes and guidelines. According to the decisions of the Sport Assembly IPCH is following IPC guidelines therefore in order to respect this decision and to result IPC compliant some changes have been done on the Manual. Here a summary of the main changes that has to be done. Part A: New part including the IPC Model Rules which were released in February 2017: the classification terminology, organisation and structure which is in effect since 1 January 2017 and will be obliged from 1 January 2018 for all ParaSports and ParaSport organisations including IPCH/IWAS. Part B: this is the actual PCH Classification, as voted for by the countries in 2016, following the IPC structure from part A. Changes/updates in this part: (2) Non-eligible Impairment types (IPC obligation), (3) Health Conditions that are not underlying Health Conditions for all athletes (IPC obligation), (4.3) Minimum Impairment Criteria (MIC) for each impairment type: so not only for the Power impaired athletes, but also for those athletes with Range of Motion, Short stature, Limb deficiency and Coordination impairments (IPC obligation), (5.2) Extension of our needed tests for those (other) impairment groups (IPC obligation), (6.1) Assessment criteria Arm profile for all impairment types (IPC obligation). Part C Attachments: new here is (1) Attachment Classifier Training and Certification Program (IPC obligation and IPC Model), (3) Medical Diagnostic Form (IPC obligation), (5) Updated PCH Classification Form, (8) Measurement of loss of Limb/Limb deficiency (IPC obligation), (9) Coordination tests for coordination impaired athletes (IPC obligation). The current edition of the Manual will be valid from 22nd June 2017. No Replies to "New classification manual released"